Memorial Day weekend 2006 marked the grand opening of the new Vanston Park Pool located at 2913 Oates Drive. 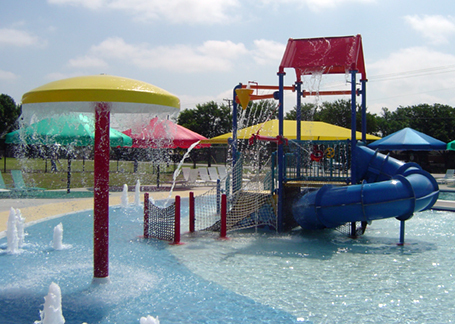 This dedication was the culmination of two years of intense design and construction operations with the single goal of creating the most exciting, entertaining, multi-purpose aquatic experience the City of Mesquite, Texas, could provide its residents. The team of Kimley Horn & Associates and Counsilman-Hunsaker was retained by the City of Mesquite to renovate and replace the existing pool with a new multi-use pool. The city’s former 40-year-old pool was not in structural condition to reopen after the close of the 2004 summer season. The best maintenance practices could no longer keep up with the heavy demand placed on this aging facility and the growing community wanted a modern aquatic facility to serve and meet its leisure and fitness needs. The aquatic center features the latest trend in combining pools, waterslides, and water toys all in one location through innovation and technology.